SPOILERS AND WARNING: Curly survived the attack and he is doing fine. This post contains graphic pictures of Curly's wounds. Curly the Pekin duck has been my unofficial blog mascot since October 2012 and some of you have seen him featured here regularly. A few weeks ago Curly had a horrible experience that changed his life forever, and if you wondered why my blogging stopped so abruptly and ahead of my annual blogging-hiatus schedule, it was because Curly needed my full attention. Curly is not a wild duck. 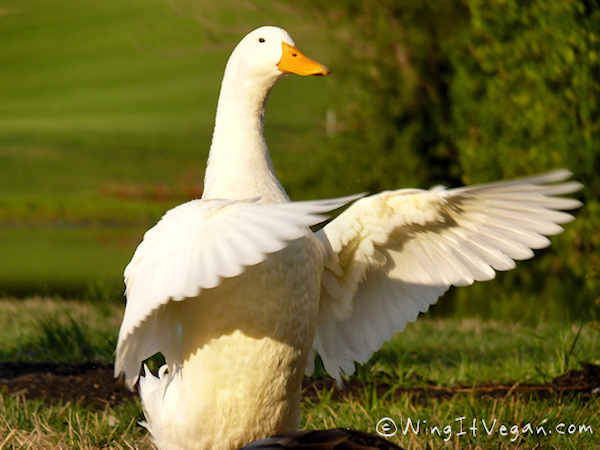 He might see himself as a pretty wild fellow, but Pekin ducks are domesticated animals that were originally bred to be non-flying farm ducks. This means that they need us humans to provide them with suitable shelter, food and water. His wild mallard friends can fly away and find food and water elsewhere when our nearby pond is completely frozen, but poor Curly is limited to walking-distance sustenance. The fact that he cannot fly also makes him particularly vulnerable to predators. He is a glorified chicken. A few weeks ago Curly was attacked by a bald eagle that tried to kill him and fly away with him. One of our neighbors saw the attack and she ran outside to try to stop the eagle who then dropped Curly onto the frozen pond and left him badly injured. Our heroic neighbor saved Curly's life. We didn't know that Curly had been hurt until later in the afternoon, hours after the attack, when we saw him walking around our backyard looking strange and confused. That's when we saw his bloody wounds. WARNING: Semi close-up of Curly's wounds coming up. We didn't know what had happened or what we could do to help. Our first instinct was to bring him into the garage where he would be safe from the coyotes that lurk around here at night. He was in shock, so it was easy for us to lure him into a cardboard box to carefully bring him inside. 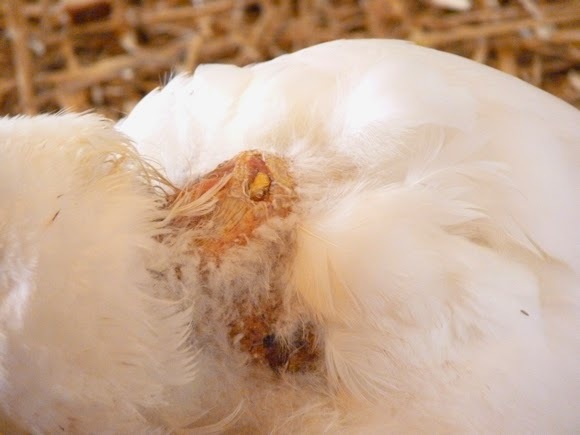 These pictures that I am showing you here were taken three days after the attack, and as you can see there was a bit of feather-fuzz already starting to grow out. The wound actually ran from side to side along the top of his back like a collar, but the pictures don't show the whole area. 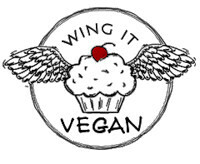 I didn't even think about taking pictures when we first saw him with blood all over his neck and dripping down his chest because Mr. Wing-It and I were also in shock. You will have to imagine how extra horrifying his wounds were when they were fresh. WARNING: Close-up of Curly's Wounds coming up. Curly was with us for five days before we found someone who could help him. The WONDERFUL people at the Wildlife Rescue Center took him in even though Curly is not a wild duck. They took excellent care of him and kept him until his wounds healed and he was ready to move on to Longmeadow Rescue Ranch. 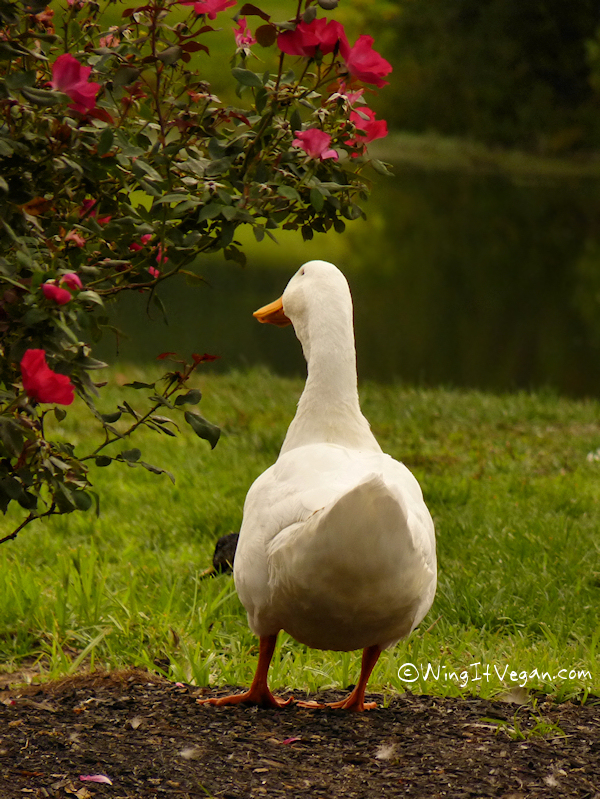 We are so grateful to everyone at the Wildlife Rescue Center for taking such good care of Curly and for everything that they do for local wildlife; and to all the kind souls at Longmeadow for giving abused and neglected farm animals a second chance at life. There he is in the comfy little corner of the garage that we arranged for him. If we had had a suitable place to keep him and if we didn't have to do so much traveling, we would have just kept him with us. 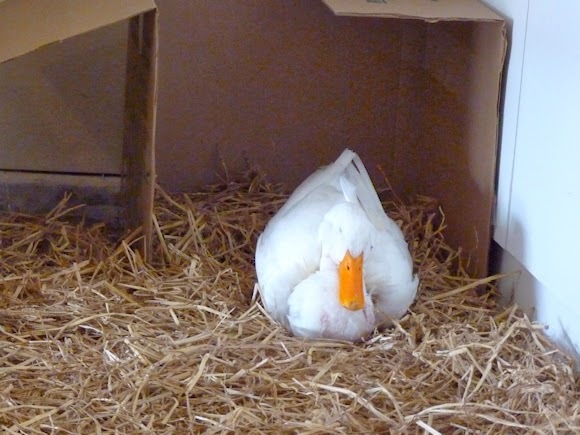 But he needs to be somewhere where he will be allowed to live like a proper duck, not cooped up in someone's garage. We miss him terribly and we're overcome with sadness every time we look out the window and he's not there hanging out with the mallards, but to keep him here just so we could see him every day would have been selfish and cruel. Even though we miss him dearly, it's so comforting to know that Curly is now safe and healthy. 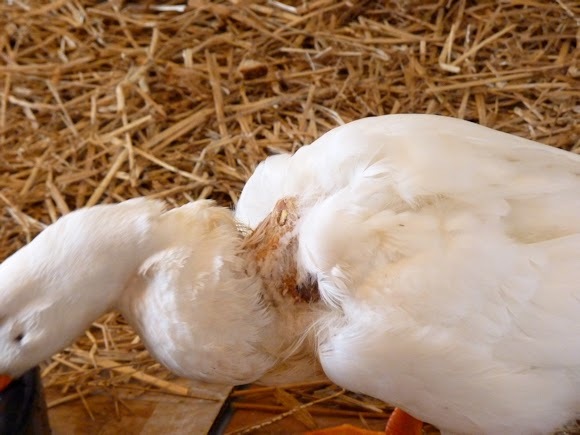 * If you are thinking about buying a little Pekin duckling for Easter this year, then on behalf of Curly I beg you to reconsider. That is how Curly ended up here - our neighbors down the street bought him as an Easter gift for their kids a few years ago and then released him into the wilderness when he was all grown up. Without proper shelter from predators it's a miracle that as a domesticated duck he survived for so long out there! Also remember that having a farm animal in your home could be illegal in your area. 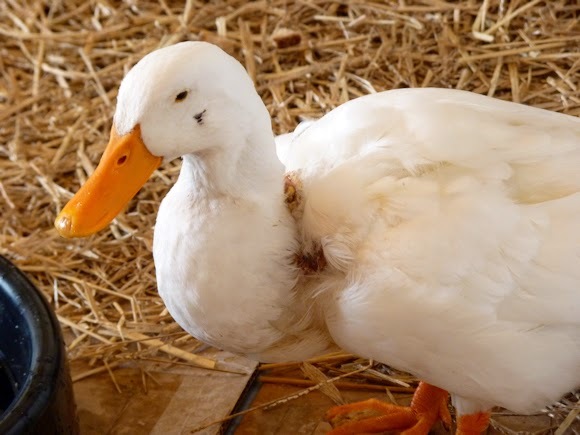 * If you are reading this after Easter and you already bought a duckling without knowing that it wasn't a wild animal, then on behalf of Curly I beg you not to throw it out to fend for itself. Look up local animal rescue organizations and someone will be able to help you. A simple google search led us to the Wildlife Rescue Center which wasn't too far from us. Your duck depends on you to find him or her a safe place! * Baby chickens and bunnies need proper care too! Please don't buy them this Easter! You can read about the horrors of the egg/chicken industry here. Again, remember that having a farm animal in your home could be illegal in your area. If you already bought a chick or a bunny and they're all grown up and walking around your house pooping all over your carpet, please do find a safe place for them where they can live long happy lives. Please help me spread the word so we can keep animals safe this Easter! Help me share Curly's story on Facebook, Twitter, Pinterest, the checkout line at the grocery store, the waiting room at the dentist's office, or anywhere where anyone will hear you! Curly says THANK YOU! I'm SO relieved that Curly is doing much better - oh my goodness. As the people at my dog's former animal shelter always say around Easter time, "Put a chocolate bunny in your child's Easter basket this year - not a real one." It's cruel to give people animals as a surprise and then the animals end up abandoned, hurt, etc. Oh Curly, that is horrible. I am so glad he has made a recovery and has found a place of safety. Thankfully buying ducks and chicks for easter isn't really a thing here, and bunnies are actually banned in the state I live in. Lots of love to all of you, thank you for being a hero to little Curly. The US needs to learn a thing or two from Australia then! Curly was lucky to have a chain of people who cared about him - our heroic neighbor who actually saved his life, then we took him in, then the Wildlife Rescue Center rehabilitated him, and now the people at Longmeadow Rescue Ranch will find him a good home. Considering how horrible the attack was, Curly is a lucky ducky! Poor Curly. Thank heavens he had you looking out for him after the attack. Your post is an important reminder that animals shouldn't be seen as temporary entertainment. Safe travels. That's exactly what these poor chicks and bunnies are sold as, temporary entertainment. Oh my goodness poor Curly. I'm glad he's doing better!! Poor Curly! I'm so happy that a neighbor was able to save him before the eagle did too much damage. I had no idea that there were ducks that can't fly, as far as I know, ducks and chickens are illegal to have as pets in my city, and I hope it stays that way. I don't understand why someone would give a random lifelong commitment as a gift. I'm really glad to hear that he's doing well!